From left to right starting at the top row first the going from left to right along the bottom row. Each dress has top and circle skirt. Picture Day Lagoona Blue has a wrap around collar. Venus McFlytrap has a straight skirt over skirt and a wrap around collar. 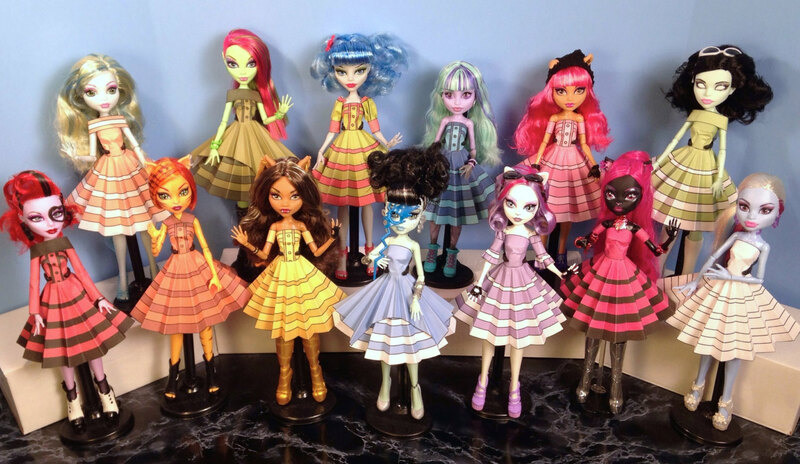 Ghoulia Yelps has puff sleeves. Twyla is just wearing the top and circle skirt. Howleen Wolf has cap sleeves. Scarah Screams has a wrap around collar. Picture Day Operetta Doll has straight sleeves and a wrap around collar. Toralei Stripe has shoulder straps. Music Festival Clawdeen Wolf has cap sleeves. Frankie Stein has a straight skirt over skirt. Catrine DeMew has middle puff sleeves. Catty Noir has cap sleeves. Abbey Bominable is just wearing the top and circle skirt. Draculaura is wearing a top and straight skirt over skirt as a skirt. Jane Boolittle is wearing a top, straight skirt over skirt mermaid skirt, a belt at the waist and one at around the mermaid skirt, and one shoulder strap. Clawdia Wolf is wearing a top, and small circle mermaid skirt. From left to right. Each of these outfits begin with a top and circle skirt. Wedding Day Barbie has a belt and shoulder straps. Enchanted Evening Barbie has sleeves made from a large circle. Barbie Solo in the Spotlight has middle puff sleeves. Barbie 35th Anniversary Brunette has shoulder straps.